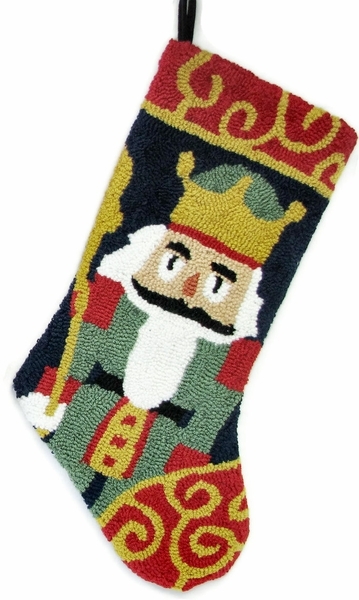 20" Christmas Stocking - wool hooked Nutcracker Design front. Back is midnight blue velvet, inside is lined with cotton fabric. Personalized on the cuff. We suggest personalization in either WHITE, GREEN or SILVER thread so the name would stand out. This is 20" Velvet Christmas stocking with a Hooked Nutcracker Design. Complimnetary designs of Hooked Christmas Stockings are available so you can make a set.